Meet Patricia Escárcega and Bill Addison, the L.A. Times’ new critics. 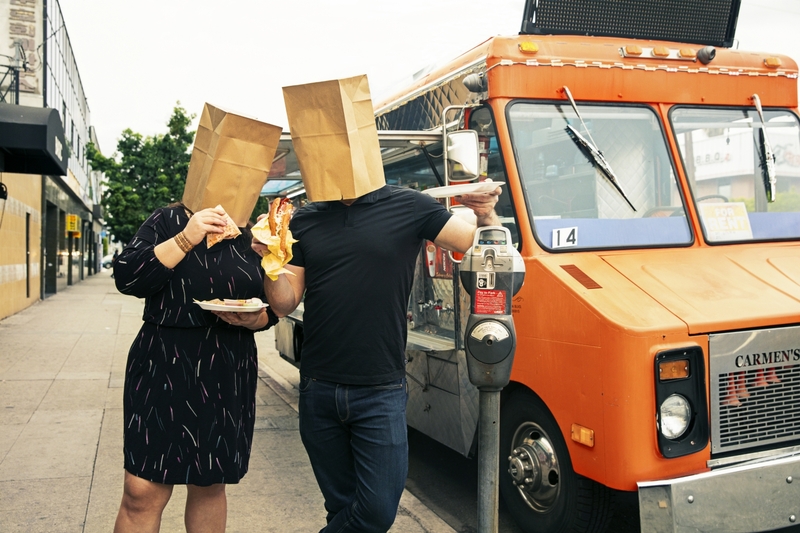 They’re anonymous (hence the bags). After the sudden passing of legendary restaurant critic Jonathan Gold last summer, the Los Angeles Times was faced with an unenviable predicament. Who would fill the shoes of the only food writer to win a Pulitzer Prize? Late last year, amid a sectionwide expansion of coverage, the paper announced the hiring of not just one critic but two, an ambitious move at a time when many publications are scaling back. Bill Addison, the former national critic at Eater and food media veteran, would share duties with Patricia Escárcega, a lesser-known but promising writer and critic from Phoenix. Both chose to perform their duties anonymously. 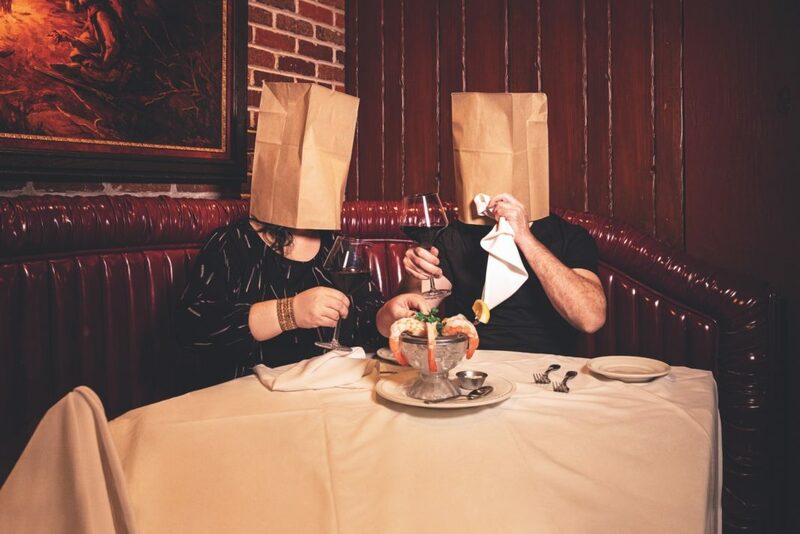 Three months into their tenure, we sat down with the nascent duo to discuss L.A.’s formidable food scene, the shifting role of criticism in a world of social media, and the challenges in following one of the city’s most iconic scribes. You’ve both been obsessed with food from a very young age. When did you realize it was your calling? Bill Addison: I grew up in Baltimore, and my parents occasionally took my brother and me out to dinner at fancy restaurants. I noticed during these meals out was that we were kinder and more patient and more open with each other than we were in any other space. My mother, who grew up on the eastern shore of Maryland, always ordered seafood, and everything had to be impeccable. My father was a politician, so he wasn’t often around. But when he was, we went to restaurants and he was like this great dad figure at the table, ordering steak and prime rib and very dadlike things. So restaurants became this happy place where we could all be together. Patricia Escárcega: I grew up about an hour from here, in Riverside, and my childhood was the opposite of Bill’s. We never did anything resembling white-tablecloth dinners. But my family bonded a lot over food, especially with my mom. She had grown up in a tiny town in Mexico, and at dinner she’d tell us stories from her childhood, and it made me realize how different her childhood was from mine. We filled that gulf talking about food. Where she grew up, every morning women would wake up early and make the masa from scratch. Stories like that fascinated me. Both of you have worked as critics in other cities. Did you approach your jobs differently from the way you do in L.A.? PE: I used to work as a food critic in Phoenix for the alt weekly there, the Phoenix New Times. It’s this big, sprawling city with so many misconceptions. There are a lot of parallels to L.A. Exploring food culture in that kind of environment yielded a lot of fascinating things that hadn’t been covered before. So I’m taking a similar kind of approach here, trying to find the quieter corners that are less explored. BA: Before I covered restaurants nationally for Eater, I worked as a reviewer in Atlanta, San Francisco, and Dallas—three sprawling cities. I’ve always had a lot of turf to cover as a critic, and I’m grateful for that because in essence your job consists of covering lots of different communities. If you only cover one kind of community, not only does your readership get a little bored but you sort of lose your energy. One question people love to ask critics is: “How do you eat out so much?” But for me it’s never dull because there’s always something besides food to think about. For years L.A. was kind of an underdog in the food world—jokes about steamed tofu and such. Some critics during that period seemed more like boosters. Now that L.A. has cemented its global reputation, is it more crucial for critics to cut through the hype? BA: One observation about Jonathan Gold was that he didn’t write very critical reviews, or he only wrote critical reviews about a specific type of high-profile restaurant. So I know that some people are really hungry for straight service journalism, and there will be room for it. I’ve written my share of negative reviews, and I do see the value in them. But I also think restaurant criticism is evolving. BA: It’s more about the context and overall experience than a dish-by-dish comparison. I’m not as interested in writing one paragraph about how the veal Oscar is great and another paragraph about how the crudo course needs more acid. I’m sure it’s a challenge to follow a critic as influential as Gold. How do you embrace his legacy while establishing your own? BA: This job, like no other I’ve ever entered, comes burdened with so much expectation—including from myself. We both have a very explicit understanding of the path that Jonathan carved. If you look at the reviews that earned him a Pulitzer, one of them is Wolfgang Puck’s Cut! He wasn’t only interested in the obscure Oaxacan restaurant. He addressed the whole breadth of food culture. PE: I’m pretty shameless about what a fan I am of Jonathan Gold, though I never got to meet him. It’s been incredibly surreal for me to be just in the proximity of where he was. We’re all kind of working in this space that he built for us. Gold was not anonymous as a critic. Why is anonymity important for you? Was it something you discussed early on with the Times? BA: I made it clear that I wanted to pursue anonymity as best I could. I’m very aware that there are pictures of me going around. They’re not posted online per se, but I’ve been doing this for a long time, so I know some are circulating in kitchens. Have you been spotted yet? BA: Well, I was reviewing a place recently with a friend, and he says, “Oh, wow, every staffer in the restaurant is staring at you!” I was just so mad. Because the staff are tense and then you’re tense, and nobody’s having the experience that’s intended. So I’m going to try and fly under the radar as long as I possibly can. Do restaurant critics wield the same power they used to? Can they still make or break a place? BA: I think they have more power to make a restaurant these days than to break one. But we’re also new here, so who knows how that plays out? I do think there’s something proudly old-fashioned and thorough about what we’re doing. PE: Everyone’s so overwhelmed with information, I think it helps to have somebody whose full-time job is to think about food. You can’t get that level of analysis or articulation from Yelp or social media. If it’s a picture of a pretty doughnut or a cheesy sandwich, that’s great, but you don’t get any kind of deep conversation. How do you divide up restaurants? BA: It turns out that Patricia and I are both incredibly polite and somewhat earnest people, so we do a very good job of figuring out who’s going to cover what. How do you balance personal identity with the expectation that a critic has to be somewhat objective? PE: I think objectivity is an illusion. If you go back and look at the canon of food literature, you won’t notice much objectivity—unless you consider only writing about French food objective. Our background colors everything we do, and it works better if we’re honest about that. Going to a taco truck feels familiar because I grew up eating that kind of food. You’ll feel that sense of familiarity when I write about it. And when I write about a white-tablecloth restaurant, hopefully I can add some insight that maybe was missing from decades of restaurant criticism. BA: The critics who are standing the test of time are people who inserted themselves into the narrative. Jonathan was quite personal in his reviews, though he expressed it in second person. That was his signature, right? So I think you strike a balance. What are the most difficult parts of doing what you do? learning a lot from him. BA: Only in the last two years have I learned restraint. I would be chowing, chowing, and finally I had to be: “Come on now, you’ve got the taste, put it down.” But it’s so true—most restaurant critics I know are preoccupied with their weight! Well, that’s why I always tell you that you look great when I see you. BA: Yeah, that was sweet. The biggest challenge of my 17-year career is creating a space to have a life beyond my job. How do I as a single gay man keep attractive and find a partner to share a life with? Journalists are often consumed by their work, but this job in particular fills up the time that most people have to themselves. Is it hard to wrangle people to eat with? PE: My husband is my usual go-to eating partner. I’m also much more of an introvert than Bill. I also have a huge family, but I’m very careful about whom I take where. Some of them are incredibly picky. I want everybody to have a nice time, so I’m always clear about the parameters. We’re going to order a lot of food, and there are certain things I’m going to have to order. BA: I think we have different experiences with this. I feel like a social director sometimes with how often I’m organizing dinners. I’m lucky in that I haven’t spent enough time in L.A., so there’s still plenty of people I’ve yet to dine with. What do you eat off the clock? BA: I was traveling so much for Eater that I haven’t had a permanent home in two years now. I’ll hopefully have one by the time this comes out. So at the moment I’m living a cliché: When I am off the clock, I eat salads—low-carb, high-protein salads. PE: I love fruit; I’m very into citrus, avocados. Also my husband is an incredible cook. It’s becomes an incredible privilege to have a home-cooked meal because you don’t get to have it often. PE: I definitely have more of a sweet tooth, especially when it comes to pastries. That’s a constant temptation. BA: I don’t consider it a vice necessarily, but I’ve always been a sucker for Popeye’s. Spicy, dark—that’s my go-to order.